This tubular steel and rattan chair has nothing in common with the widely used romantic wicker furniture in the country-house or colonial style. What we have here is a strictly architectural design by Bauhaus alumnus Herbert Hirche. The part you perceive as the backrest is also the armrest. A member of the German Design Council since 1961, interior and furniture designer Herbert Hirche and his team designed the interior of the Santa Lucia restaurant, first in 1956 and again in 1969. Santa Lucia was the first Italian trattoria and pizzeria in Stuttgart. As part of the interior design, Hirche created two chairs named after the restaurant. At the end of the 1990s, we started to reproduce one of these chairs, designed in 1969. 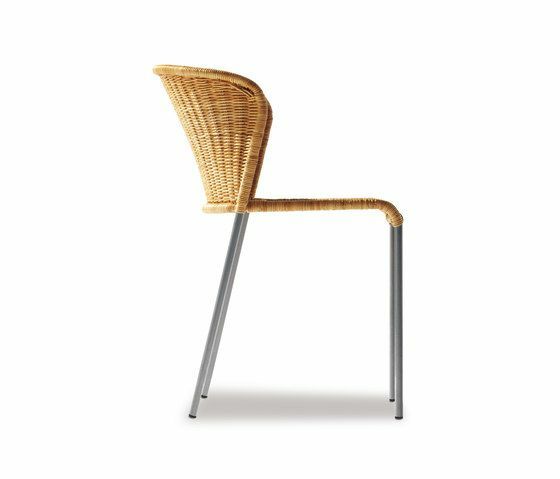 The Santa Lucia chair can be used in both private and commercial interiors, either at the dining or kitchen table at home or as a chair in restaurants and cafés. Since 2009, the chair has also been available in an outdoor version made from low-maintenance plastic polyethylene fiber. And, of course, there are also matching cushions.